Do potential students get the right impression when they first see your institution or its website? There are a lot of colleges vying for the attention of potential students. Tuition rates are on the rise, and students are choosier than ever about where they enroll. How can you attract them to your school amid all the others? When you implement the right marketing strategies, your institution can maintain a steady flow of students year after year. Create valuable content for your school. Offer easy-to-access landing pages with reliable information. Create a set buyer persona. Save time with marketing automation software. Track your school’s marketing progress through marketing analytic software. Keep reading to find out how each of these strategies can increase enrollment. Like any person planning to make an investment, students want to know what your school can offer them. Your job is to make that value clear from the get-go. Make sure potential students and parents can immediately spot the value of enrolling in your institution. Increase enrollment by helping them find the right information fast. The first step is to create a buyer persona – if that’s a new term, we’ll spend more time with it later. Generally, creating a buyer persona means digging it to get to know everything possible about your ideal potential enrollee. Analyze your student demographics, behavior patterns, questions, challenges, and goals. To develop a buyer persona, you must know where your students are coming from, how they make choices, and what they want. Think about where to find this type of customer. Where will this customer be (you can place advertising there)? What questions will they have? You researched their wants and goals. Tell them how you can help them achieve success. The best marketing campaigns leverage a combination of the tools above for the most success. For example, if you know your potential students are concerned about obtaining student loans, create an informational blog post that explains loan or grant options. If they are concerned about developing healthy study habits, craft an article about how to study wisely. Write blog posts on relatable topics. Offer them helpful content on what matters to them. 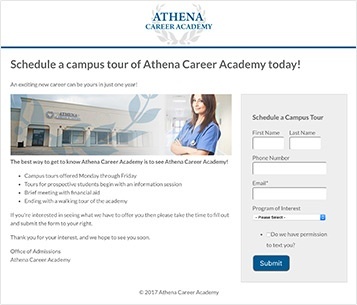 Then, link your posts to an enrollment page and turn potential prospects into students. The Awareness Stage. The potential student has just seen an ad for your school and wants to know more. The Consideration Stage. The student is considering your school and evaluating information to see if the school meets his or her needs. The Decision Stage. The student is ready to commit. He or she feels your school is the right fit and is ready to enroll. Work to catch them when they first visit, while they’re still in the awareness stage, to have the most impact. Offer something they want in exchange for their contact information. Make downloadable content available to them, so they voluntarily provide you with ways to reach them. When crafting informational pages, anticipate questions and provide answers along with interesting content. Offer eBooks, white papers, or questionnaires on landing pages. Students tell you where to send the download, and you keep that information to keep in touch. Then be present through the rest of the cycle and continue to interest them in your school. When they see your name, again and again, it sticks in their heads. Name recognition is good, but you should make it easy to contact you with their questions. You want your enrollment page to feel like it’s a click away and that it has all the answers. As they evaluate their college choices, they will likely find themselves leaning toward the school with which they’ve become familiar. Choosing a college is a huge decision. When students know more about your school, they feel better about committing. Students whose interests are outside your target group are unlikely to return, so you attract the ones who are the best fit. Conducting surveys, interviews, and market research regarding your school. Looking through your current student database and identifying trends about where students come from geographically. Analyzing what’s important to your current students. What organizations are they involved in; what hobbies are they developing; what do they do in their free time; what are they passionate about; what are their long-term career goals? Gather knowledge from potential students visiting your website. Offer incentives to complete surveys that tell you their interests, concerns, and favorite websites. Use this information to create your buyer persona. Some businesses give this person a name and a photo. For a college, you may have more than one. For instance, if your school is located near national parks but is also known for its music school, one persona will be outdoorsy and the other musically inclined. But be cautious about casting your net too wide. Target customers based on what they want and what you provide. A personalized sales pitch makes you stand out and provides the best-fitting students for enrollment in your institution. Most students access social media platforms every day. They sign in to Facebook, Snapchat, Instagram, and Twitter to keep in touch with friends. The same mobile apps that quickly connect potential students with their peers also offer you access to these people. Be involved in their interests. Be relatable to their generation. Use social media to stay in front of them through cookie-based technology called retargeting. They gather information and leave. Later, they visit social media and your school’s ad pops up. They remember questions they had about your institution or your ad's content draws them in. They return to your site and eventually choose to enroll. Understand who your audience is, where they are looking, and what they want. Since most college students are active on social media, that’s one of the best places to gain exposure. Use the information you gathered about what matters to them. Write content that targets your audience. When students connect your institution with the things that matter to them, they are more likely to enroll. Market automation software (MAS) is a tool that helps you run marketing campaigns and measure their success. It’s just what it sounds like – software that automates the marketing process. It includes whatever marketing campaigns you choose. A common misconception is that MAS just involves email marketing, but there’s more to it than that. MAS incorporates email campaigns and phone campaigns, social media marketing, lead management, landing pages and forms, marketing analytics, and more. What Can MAS Do for You? Content management systems quickly create content to engage students with your school. Email marketing tools to send notifications and follow-up emails. Customer relationship management tracks the activity all interactions an interested contact has with your website giving you valuable data on their level of engagement. Enables you to see your entire marketing and sales efforts in a single dashboard. Help you stay targeted and specific. With MAS, the power is in your hands – stay in front of your target audience on a consistent basis with little effort on your part. To know which strategies worked so you can do more of them so you can funnel your advertising dollars into the right areas, use market automation software. For example, if you have wave after wave of email marketing with little results, you’re wasting money. Analyze who responded and identify more people like them. Focus on that target group for your next marketing campaign and reach your audience. Once you have that information, assess how your audience responded to your website, blog, and landing pages. Make sure your marketing messages work on a wide range of devices. If your audience goes to your site, but it won’t open on their devices, they’re unlikely to try again. Don’t miss opportunities because links don’t work or pages designed for desktop devices don’t work on mobile devices. With these tools in your arsenal, consider responsive web design for your marketing materials. Responsive web design formats across devices – from a desktop to smartphone. You don’t want to lose potential students because your site wouldn’t load on their devices. Students want more from college than just a piece of paper. They are looking for self-development, a chance to reach their goals, and a universal understanding of their world. Higher education is a stepping stone into their future. Craft your marketing message to reach your target audience. They have a wide variety of talents and interests – and those things can help you attract them. Engage them through captivating content that is relevant to their experience. Use marketing automation software to track your campaign and then evaluate your strategies, adjusting where necessary. When it’s time, reach out again. Finding the right strategy for your school will help you personalize your marketing. Show your students how your institution is the right fit for them, and watch your enrollment improve.